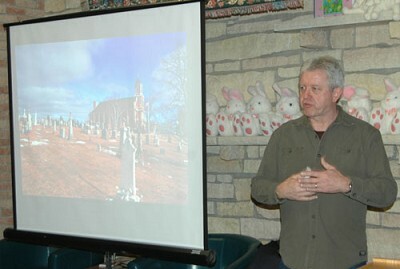 Doug Ohman, a freelance photographer and public speaker, displayed his photos of cemeteries and graveyards on a large screen as he spoke to an attentive audience at the Stewartville Public Library on Thursday evening, March 28. Doug Ohman sees cemeteries as tranquil places where people can talk to their ancestors. Ohman, a freelance photographer and public speaker, sometimes visits the cemetery where his dad is buried. "I have cake with my dad, and I eat both pieces," he said. Cemeteries are important because they are places of solace for the living, Ohman told a large audience of listeners at the Stewartville Public Library on Thursday, March 28. "Cemeteries are for whom?" he asked. "For us. The dead don't care, but we care. The living are why we have memorials, why we have monuments, why we have cemeteries. For us."